In 3-quart saucepan, mix potatoes and garlic; add enough water (salted if desired) to cover. Cover and heat to boiling; reduce heat. Simmer covered 20 to 25 minutes or until tender; drain. Shake pan with potatoes over low heat to dry. Mash potatoes and garlic in pan with potato masher or electric mixer until no lumps remain. Grease 2-quart casserole. Spoon potatoes into casserole; cover and refrigerate up to 24 hours. Heat oven to 350°F. Pour reserved milk mixture over potatoes. Bake uncovered 40 to 45 minutes or until hot. Stir potatoes before serving. If you're not serving gravy with the mashed potatoes, try any of these ideas for perking up your potatoes: • Sprinkle 1 cup crushed herb-seasoned croutons over potatoes. 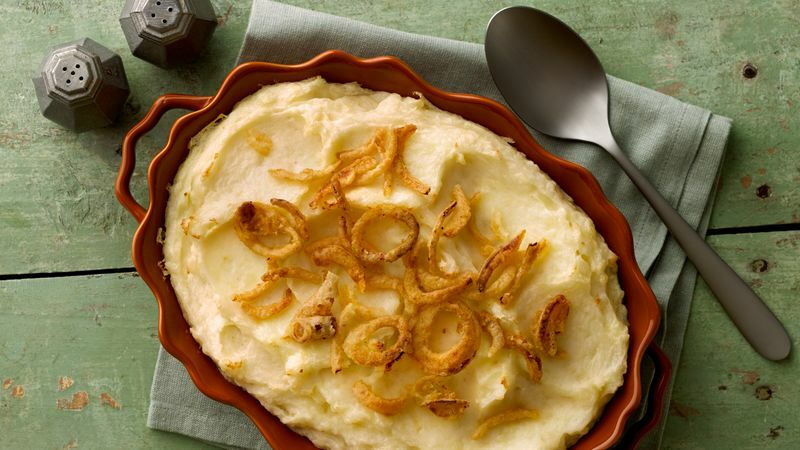 • Sprinkle 1 can (2.8 ounces) French-fried onions over potatoes. • Place purchased pesto in a resealable plastic bag; snip off a tiny corner and drizzle pesto over potatoes. • Sprinkle shredded Parmesan cheese over potatoes. To bake at a lower oven temperature, heat oven to 325°F. Pour reserved milk mixture over potatoes. Bake uncovered 60 to 65 minutes or until potatoes are hot. Just before serving, stir potatoes.